Few packaged goods have as strong an association with design-driven work as Häagen-Dazs, with little narrative typically needed as the brand visually communicates its high-end positioning. In its first work from new U.S. creative partner, J. Walter Thompson, Häagen-Dazs advances that tradition and introduces a tagline playing off its name: "äah." "Häagen-Dazs has always aspired to a nice, clean aesthetic. They strip everything down to the essentials—focusing on simple, pure, ultra-premium ice cream," explained Chris Dealy, ecd at JWT, New York. "Aesthetically, we wanted to treat the layout like a very high-end fashion brand." The new JWT campaign launches this week with 15-second national TV spots and will be followed by a four-city, out-of-home (OOH) pitch next month. The entire campaign uses a clean, simple imagery, while the commercials employ a voiceover asking viewers how to describe something "so pure, yet so indulgent." 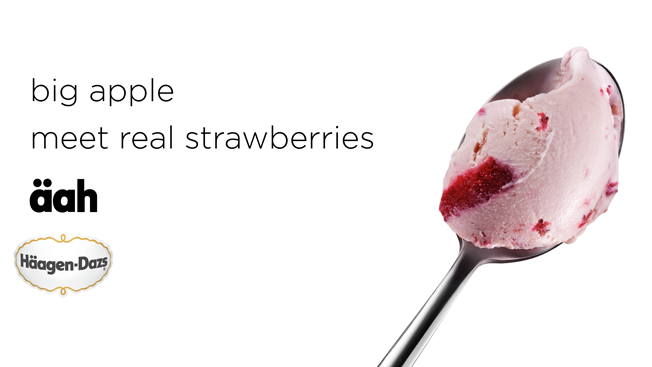 A spoon elegantly scoops vanilla ice cream, revealing the word "äah." Even at the spot's end, the brand's ionic doily logo is reduced to its basic shape sans the container.